In a previous post I listed my top 5 books on revival. But I hadn't read this one. Last week I began to read it and very quickly wished I had read it earlier. It wasn't a hard read. It was actually a very simple straightforward read. It was also very difficult to put down! But it was hard in another way: it was painful. It was convicting on a level few other books are. Its odd (isn't it) that this book is out of print. I can't think of a book more urgently needed at this time! Is it because we no longer see our own need? Is it because it is too painful? I don't know the reason, but it is a situation that needs to be somehow rectified. If you are going to read a book on revival I would beg you to begin here. But that raises a problem. There are few copies available anymore; which means you may need to write Richard Owen Roberts. Don't hesitate to do so. This books needs to be reprinted. First, you will find out what revival is. Roberts' description is simple, beautiful and winsome. You will read and you will find it hard not to weep. You will read and long and pray. 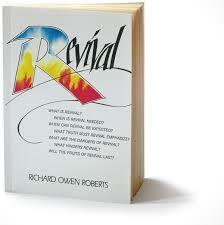 No born again Christian can read this brief introduction to revival without longing to see such a thing again. You won't want ease in Zion anymore. You won't want 'ordinary' you will long for the extraordinary. Second, you will find out when revival is needed... and this is the part that hurts. Because here the author describes a backslidden Church. This part was hard. I've always felt revival was needed, but never so keenly as when this section. If you are willing to be convinced that revival is needed, if you are not sure revival is needed this is the book you need. Third, you will find out what needs to happen if we will see revival. This book - if it were read- could change the Church. Get it if you can and read it. Here I want to recommend books on the theme of revival. Years ago I was introduced to Why Revival Tarries by Leonard Ravenhill. That book (in 2003) changed my life. In fact it had more of an impact on me than any book since. From that point I have had a growing interest in the subject of revival and also a growing burden to see the Lord revive the Church in this country. In 2004 I discovered Sermon Index. That year I heard three sermons/talks that dramatically impacted me. The first was titled Ten Shekels and a Shirt. Though it isn't a sermon on revival, the subject of revival came up. It was a sermon that changed my perspective on God, missions, salvation and revival. The second was a gripping account of the revival in the Hebrides by Duncan Campbell. The third was an interview with Leonard Ravenhill. These three had a formative influence on my life and added to my growing sense that the Church's great need is for a fresh awakening. Since that time I have moved from an Arminian Baptist persuasion to confessional Presbyterianism, but I am more convinced of our need for revival today then I was back in 2004. Over the years I have read a number of tremendous books on this subject, which makes it particularly difficult to narrow the list to just 5. Hopefully someone will find this list read these 5 and then go on to read more! 1. 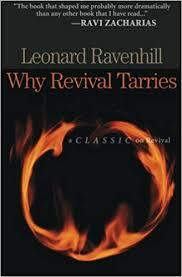 Why Revival Tarries by Leonard Ravenhill - This book is a stirring call to the Church by a man burdened for revival. It is not so much a description of revival as a call for prayer. I vividly remember my first time through that book. I had read just one page and I was down on my knees. 2. Revival! A people saturated with God by Brian Edwards - This is probably the single best introduction to the subject of revival. It is a simple read, and perfect for lay people. If you don't know what revival is this is the book to read first. This book is currently out of print, but the author has told me it should be reprinted soon. 3. Come Down, Lord! by Roger Ellsworth - This is a very simple but moving book. Working from Isaiah 63 Ellsworth shows how the Church may seek revival. We begin, he says, by telling God we miss Him. 4. Revival of Religion - Of the five on this list this one is easily my favourite. It has the substance that some of the other books lack, but it is also powerful. 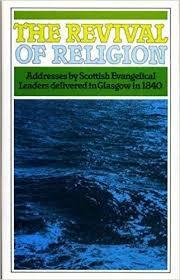 Here is a collection of addresses given by men filled with the Spirit and deeply burdened for the Church in Scotland. These men were surrounded by ministers and scholars content with the 'ordinary' and puzzled by their fascination with revival. Their answer is as tremendous as it is convicting. You cannot read this book without going to prayer with longings that God would again come down. Sadly, this book is also out of print, though copies can be found. 5. Revival by D. Martyn Lloyd-Jones - This book is a collection of sermons preached in 1959. It isn't light reading, but it is gripping. Here Lloyd-Jones explains what revival is and why the Church so urgently needs it. It is a wonderful read that will leave you longing not merely for revival but for God. Note: You may wonder why Richard Owen Roberts' book isn't on the list. I confess I haven't read it. I recently obtained a copy and plan to read it soon. Edit March 23: See my review of Roberts' book here. It is a book that easily deserves a place at the top of this list of 5. When I first read the Social Justice Statement authored by John MacArthur and others I hesitated to sign it. There were two sections that I struggled with. My intent, here, is to briefly examine those two sections and then explain why I signed the document anyway. I had no problem with the affirmation, but struggled with the denial. What did they mean by saying “the implications and applications of the gospel, such the obligation to live justly in the world, though legitimate and important in their own right, are not definitional components of the gospel”? 1 Corinthians tells us that what matters to God is not circumcision or uncircumcision but keeping God’s commandments. Hebrews says without holiness no one will see the Lord. 1 John says, “And hereby we do know that we know him, if we keep his commandments (1 John 2:3).” James says faith without works is dead. The Westminster Confession of Faith, chapter XV says, “I. Repentance unto life is an evangelical grace, the doctrine whereof is to be preached by every minister of the Gospel, as well as that of faith in Christ. I wondered what they meant by saying that the obligation to live justly is not a "definitional component of the gospel." If they meant that repentance is not “of such necessity to all sinners, that none may expect pardon without it (WCF, XV, 3)” than I couldn't possibly sign it. But I know what many of these men - the initial signers - believe and stand for, so I felt certain this couldn't be the case. Certainly the wording might be stronger. Actually, I wish it were. If by living justly they are referring to the obligation to keep God's law - our obligation to love Him and to love our neighbour - than that obligation lies at the very heart of Christianity. The obligation to live justly is not merely legitimate and important in its own right. Without holiness no one will see the Lord. Still, I think I understood what they meant by definitional component. They were saying as Paul did that "a man is not justified by the works of the law, but by the faith of Jesus Christ, even we have believed in Jesus Christ, that we might be justified by the faith of Christ and not by the works of the law: for by the works of the law shall no flesh be justified (Galatians 2:10)." Paul went on: "O foolish Galatians! Who has bewitched you that you should not obey the truth, before whose eyes Jesus Christ was clearly portrayed among you as crucified? 2 This only I want to learn from you: Did you receive the Spirit by the works of the law, or by the hearing of faith (Galatians 3:1-2)?" It was a rhetorical answer. They all knew the answer very well: It was by the hearing of faith that they received the Spirit not by the works of the law, not by walking justly. Paul added, "Therefore know that only those who are of faith are sons of Abraham. And the Scripture, foreseeing that God would justify the Gentiles by faith, preached the gospel to Abraham beforehand, saying, “In you all the nations shall be blessed.” So then those who are of faith are blessed with believing Abraham. For as many as are of the works of the law are under the curse; for it is written, “Cursed is everyone who does not continue in all things which are written in the book of the law, to do them.” But that no one is justified by the law in the sight of God is evident, for “the just shall live by faith.” Yet the law is not of faith, but “the man who does them shall live by them.” Christ has redeemed us from the curse of the law, having become a curse for us (for it is written, “Cursed is everyone who hangs on a tree”), that the blessing of Abraham might come upon the Gentiles in Christ Jesus, that we might receive the promise of the Spirit through faith (3:7-14)." "Those whom God effectually calls, he also freely justifies; not by infusing righteousness into them, but by pardoning their sins, and by accounting and accepting their persons as righteous; not for any thing wrought in them, or done by them, but for Christ's sake alone; nor by imputing faith itself, the act of believing, or any other evangelical obedience to them, as their righteousness; but by imputing the obedience and satisfaction of Christ unto them,they receiving and resting on Him and his righteousness by faith; which faith they have not of themselves, it is the gift of God." In chapter XIV they add the following on faith: "...the principal acts of saving faith are accepting, receiving, and resting upon Christ alone for justification, sanctification, and eternal life, by virtue of the covenant of grace." By definitional component of the gospel the signers were almost certainly referring to the free offer of the gospel, which comes to us telling us not what we must do but what Christ has done. They were not telling us that the fruit is unimportant! They were insisting, rather, that the fruit is a product. As RL Dabney put it, "The man who understands that Christ has justified him, not by, but in order to, good works, cannot possibly slight their importance (see Discussions, vol. 1)." 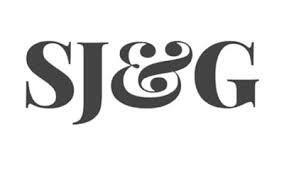 It is this great truth that the signers seem to be referring to, that Christ has indeed justified us in order to good works, but it is He alone who has justified us and not by works but by grace. In spite of my dissatisfaction with the wording of the denial, I signed it because I want the Church to hold fast in a generation that is confused and disordered; and I hope and believe this statement may be used to that end. When all around us Christian leaders are urging us to take up social causes and thunder against injustice and inequality we must determine like Paul to know nothing but Jesus Christ and Him crucified. This does not mean that we do not care about justice, nor does it mean that obedience to God's commandments is optional and/or peripheral. It means, rather, that our primary concern is the glory of God in the salvation of sinners; and we will continue to testify that they are saved by grace alone through faith alone in Christ alone. "WE AFFIRM that the primary role of the church is to worship God through the preaching of his word, teaching sound doctrine, observing baptism and the Lord’s Supper, refuting those who contradict, equipping the saints, and evangelizing the lost. We affirm that when the primacy of the gospel is maintained that this often has a positive effect on the culture in which various societal ills are mollified. We affirm that, under the lordship of Christ, we are to obey the governing authorities established by God and pray for civil leaders. WE DENY that political or social activism should be viewed as integral components of the gospel or primary to the mission of the church. Though believers can and should utilize all lawful means that God has providentially established to have some effect on the laws of a society, we deny that these activities are either evidence of saving faith or constitute a central part of the church’s mission given to her by Jesus Christ, her head. We deny that laws or regulations possess any inherent power to change sinful hearts." Once again I had no problem with the affirmation, but I struggled to understand what was meant by the denial. It was this statement that gave me the most trouble: "Though believers can and should utilize all lawful means that God has providentially established to have some effect on the laws of a society, we deny that these activities are either evidence of saving faith or constitute a central part of the church’s mission given to her by Jesus Christ, her head." I wondered, "can it never be said that social activism is evidence of saving faith? And is there no way to understand justice and mercy as central to the church's mission?" My problem was that I was expecting too much of the statement. It is not (like the WCF) meant to be a summary of the Christian faith. It is written in response to a current problem facing Western churches. I suspect Johnson has made a similar error. The statement nowhere hints that ministry in deed should be separated from ministry in word. In fact, Johnson's question about helping the sick and feeding the hungry (though well meant) is irrelevant. The statement is not suggesting we needn't do such things. Instead, they are insisting that specifically political or social activism and other efforts to change laws are not "evidence of saving faith" and do not "constitute a central part of the church's mission." Actually, the Church can easily help the sick, the hungry and the oppressed without actively working to change laws and policies. There is a significant difference between social and political activism and the mercy ministry of a local church. Notice, too, that the document never says the Church should never attempt such things. Rather, they insist these things are not central to her mission nor evidence of saving faith. I understand Johnson's concern. There is something appalling about a Church that does not bother to help the poor and the hungry. This is a mark of hypocrisy, and it brings the gospel into disrepute. But the Statement on Social Justice & the Gospel is addressing specifically the mission of the church. Why does she exist? What is her purpose? If we are constrained by the love of Christ we will certainly have compassion on the fatherless and widows. If we love Him we will keep His commandments and so keep the 6th commandment, for example. But we are ambassadors of Christ sent to proclaim a very particular message with a very specific aim. I cannot help but think of that moment when that lame man "seeing Peter and John about to go into the temple, asked for alms (Acts 3:3)." Do you remember what Peter said? "Silver and gold I do not have, but what I do have I give you... (3:6)" There are times when, to her shame, the Church has been (like the Pharisees) doctrinally sound but unjust and unloving. But there are times, too, when the Church has neither silver nor gold, and yet still she can carry out her mission as she goes into the world saying "silver and gold I do not have, but what I do have I give you." The church exists for the glory of God in the salvation of sinners. Her message is Jesus Christ and Him crucified. We may not have money, but what we do have we can give them. This is the mission of the Church, to go into all the world and offer what we do have, which is the gospel of the glory of Christ. I am a confessional Presbyterian, so I have a statement of faith to which I adhere. I thought about not signing for that reason. But the WCF was not written to address the issues which this statement addresses. The Statement on Social Justice & the Gospel, like so many statements before it was written to address a present crisis in the Church. Though I might have worded it differently in places, I signed the document because I believe we need to contend earnestly for the faith; and I am convinced it is the faith "which was once for all delivered to the saints" that is being unwittingly undermined. I wanted to add my name to the list of those who are concerned that the Church is becoming distracted from her mission and losing sight of the power of the gospel. I believe it is a tragedy when the Church gathers to discuss politics, race, and social inequality when it could be discussing Jesus. We are in danger of forgetting the sufficiency of our Saviour. And already we are showing signs that we no longer think the proclamation of the gospel is enough for a dying world. May God reform and revive us! Thornwell once said, "The glory of Christianity is its Saviour, and His power to save is in the blood by which he extinguished the fires of the curse, and the righteousness by which He bought life for all His followers. Jesus made our curse, Jesus made our righteousness, this, this is the Gospel! All else is philosophy and vain deceit. This it is which gives Christianity its power. By this, and this alone, it subdues the ferocity of passion, disarms temptation of its violence, disrobes the world of its charms, changes the tiger into the lamb, and makes the lion eat straw like the ox. This constitutes the grand difference between the religion of Mohammed and the religion of Jesus, between the Koran and the Bible (see The Collected Writings of James Henley Thornwell, vol. 2; italics are mine)." I am hoping to review David Murray's book more thoroughly in the future. For now I will be brief. There were helpful elements in his book for which I am grateful and which made me hesitate to offer criticism. But I feel constrained to say something. Though helped in a number of places, on the whole I was disappointed. Here is a book that would effectively rid the Church of her Brainerds, her Whitefields and her M'Cheyenes. It is a book in short, which tells men of this generation not to do what they did. Keep in mind these were men who sacrificed their bodies for the work of the kingdom. They prayed that they would not outlive their usefulness and willingly poured themselves out as a drink offering to God. They were not alone. Many of our biographies tell similar stories of men who in answer to the call of Christ took up their cross and followed Jesus down into 'premature' death. They willingly offered themselves on the altar of God's service and like Epaphroditus put the glory of Christ and the spread of the gospel before their own health. David Murray argues for something different. He insists, for example, on the priority that should be placed on getting enough sleep; and he writes critically of those who sacrifice the 7-8 hours of 'necessary' sleep for prayer. Thomas Brooks had another idea. He said, "servants should rather redeem time from their sleep, their recreations, their daily meals, than neglect closet-duty a day. And certainly those servants that, out of conscience towards God, and out of a due regard to the internal and eternal welfare of their own souls, shall every day redeem an hour's time from their sleep, or sports, or feedings, to spend with God in secret, they shall find by experience that the Lord will make a few hours' sleep sweeter and better than many hours' sleep to them; and their outward sports shall be made up with inward delights; and for their common bread, God will feed them with that bread that came down from heaven." See The Works of Thomas Brooks, Volume 2, p. 215-216. 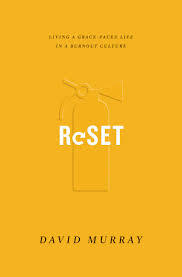 Reset is in parts rich in worldly wisdom and lacking in that heavenly mindset that characterized so many of our forefathers. Though it is in places very useful, I am convinced that it offers a dangerous message to this generation of pampered lukewarm Christians. "If I shall receive my body again so dignified and improved in the world to come, then Lord let me never be unwilling to use my body now for the interest of thy glory, or my own salvation! Now, O my God, it grieves me to think how many precious opportunities of serving and honouring thee I have lost, under pretence of endangering my health! Do you remember when you were as - John Flavel put it - "restless and impatient… in His absence!" O you could bear anything but that. Sickness you could bear. Pain and temporal losses you could endure. But His absence was unbearable. You couldn't stand to go on without the sense of His dear smile. You longed to walk and live and breathe in the light of His countenance. Do you remember when “Divine withdrawments were to you as the hell of hell (Flavel).” Those seasons when God seemed to hide His face from you, when He was distant, and there wasn't that familiar communion and fellowship in the prayer closet were to you as hell. You wept and you groaned and you cried for His return. You stirred yourself to take hold of God (Isaiah 6:7), you wrestled with Him as you told Him you would not let Him go. Do you remember when the world was a burden to you? Do you remember a time when if it weren't for your sense of duty you would have gladly and willing let everything else alone (you would have neglected a whole world) if only to enjoy uninterrupted communion with Jesus? This was your one thing: to dwell in the house of your God and behold His beauty (Psalm 27). How you loved to sit at the feet of Jesus. Do you remember when you woke in the night and you could say, "the darkness [was] enlightened by the heavenly glimpses of the countenance of my God upon me? How did His company shorten those hours… (Flavel)." You could say with the psalmist (63), that you remembered Him upon your bed, you meditated on Him in the night watches. His lovingkindness was better than life, your soul was satisfied as with marrow and fatness, your mouth praised Him with joyful lips and you rejoiced in the shadow of His wings. But now it is not so. You are living at a distance from your beloved. How sad to think that you have been content to remain hidden from Him. Though He watches you with love and urges you to speak and tells you how He loves to hear the sound of your voice in the prayer closet (Song of Solomon 2), your voice is not heard, your prayer closet lies empty. You have become fascinated with the world's toys. You have grown weary of God; and He comes to you asking, "have I been a wilderness to you (Jeremiah 2:31)?" Has he been a land of darkness? How can this be that a bride would forget her Groom and that a people redeemed at the price of His blood should so soon forget their love? Has he been so unkind to you that you should treat Him like this? Is this how to requite the Lamb slain from the foundation of the world? Distil its dews, reflect its beams. In which my heart within me burn'd. O halcyon* days! Thrice happy state! Whilst with thee I did daily walk! As oft as on those days I think. Tis just as if I were two men. * According to an online dictionary a halcyon "denotes a period of time in the past that was idyllically happy and peaceful." Dear backsliding Christian, isn't it time to cry mightily to the Lord for quickening? Why not get down on your knees right now and say to Him, "O God I miss you." You will have noticed by now that I am not following any particular order. I do hope to eventually cover the various doctrinal loci. Here I want to recommend books for the Lord's Day. As a pastor I am always reading commentaries and theological works, so it is important for me to keep the Sabbath somehow different. Here is a day of worship, and I have sought, then, to read material that will bring me into worship. To that end I generally confine my Sunday reading to sermons. There are, of course, other books appropriate for the day. I think, for example, of Octavius Winslow's Personal Declension and Revival of Religion in the Soul or some of the great Christian biographies (M'Cheyne, Bonar, Nettleton, Whitefield, Lloyd-Jones, Elias, Harris, Burns, Dabney, etc.) or histories of revival or any of the great books on the person of Christ listed in an earlier post. In this post, however, I will offer just 5 books - the best 5 that I am aware of - which contain sermons suitable for this day which ought to be for the Christian a kind of heaven on earth. I have written elsewhere about growing up without the Sabbath. For years I was convinced that Sabbath keeping was legalistic. Apart from Sunday morning worship my Sundays were my own. When confronted (10 years ago) with the consistent testimony and example of our forefathers I began studying the matter and became convinced that Sunday is the Christian Sabbath. I began to observe the day thinking it would be a costly and painful endeavour. I have found instead that it is the very best of days; indeed, it is the queen of days. I have learned as the old saying goes that "a Sabbath well spent brings a week of content." 1. The Shadow of Calvary by Hugh Martin. This book was a Christmas gift from my parents. It interested me because of the title, but I really didn't know what to expect except that it was a Banner publication and (therefore) had to be good. It is better than good. Hugh Martin has made me think about the events leading up to the cross in ways I have never have before. Better than that I have come to appreciate Christ's work at Calvary still more. On more than one occasion this book has brought me to tears. Reading these sermons you cannot help but be confronted on one hand with the appalling wickedness of our ingratitude to Christ as well the terrible price that was paid for our sin; but then, on the other hand, you cannot help but be astonished at the love of Christ which truly passes knowledge. Whatever else these sermons do they will certainly leave you more grateful to Christ. 2. Sermons by Benjamin M. Palmer. This selection of sermons amounts almost to a systematic theology, but it is more than that. Palmer was one of the greatest preachers in the history of the Church. He was well loved in his day though underappreciated in our own. Here is a volume that is worth its weight in gold. Here is what preaching ought to be. Sometimes the sermons come as a rebuke to the careless, sometimes they come as medicine to the weary, sometimes they come as an appeal to the lost but always they are rich in gospel hope. 3. Communion Sermons by Samuel Rutherford. This is a very short volume but truly valuable. Rutherford's sermons are among the very best I have read. Other great works include Quaint Sermons and Sermons Preached by the Scottish Commissioners to the Westminster Assembly. But of the 3 this is easily my favourite. It is hard to explain its value. Perhaps it is enough to say that it shows like few books do the loveliness of Jesus. 4. The Works of Ralph Erskine. So far I have only completed volume 1, but that one volume is worth the price of the collected works. No author/preacher so winsomely presents Christ in the offer of the gospel as Erskine does. If I had only a very short time to live I would probably turn to Erskine for comfort. I have been so helped by these sermons. More than once I have been stirred to the very core of my being and left wondering and worshiping. I cannot commend these sermons enough because they do what every sermon should do. They leave the reader thinking (not "what a great sermon I have read" but) "what a great Christ I have!" 5. The Most Holy Place by Charles Spurgeon. I have spent many happy Sabbaths in this book. Of course there are so many volumes of Spurgeon's sermons that I could have chosen, but this is the one that has meant the most to me. 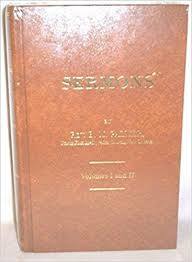 It is a collection of sermons on the Song of Solomon. Spurgeon believed that whereas much of Scripture could be described as something like the outer court of the temple and the Psalms the Holy Place, Song of Solomon could be described as the Most Holy Place; because here we are shown an intimate picture of Christ's love for His bride. I don't know if this book is available anymore. It was published by Christian Focus but may be out of print. If you can find a used copy buy it. Edit, July 13 2018: In this list I neglected a set of works that I shouldn't have. I have mentioned in previous posts John Flavel's works. I have been reading them again and realizing that they are gold. He is certainly my favourite of the puritans, and everything I read of his is fuel to a hungry soul. I have been so richly encouraged and helped by volumes 4 and 5; and yet its hard to think of anything book (apart from Ambrose's Looking Unto Jesus) which equals volume 1. So do take up Flavel's works and read them. I read them daily, but they certainly would make for rich Sabbath reading. I have offered more than once a list of favourite books and in doing so I have tried to confine my selection to just a very few. More recently I have concentrated on books that I would want to feed upon if shut up alone with just a few books other than my Bible. Here I continue a series of posts offering book recommendations on a variety of different themes such as Theology, Anthropology, Christology, Ecclesiology, Prayer, Revival and Church History (and so on). This time I am recommending books on the subject of Christian living or the Christian's progress in holiness (ie. sanctification). A section like this one could address such topics as family, parenting, prayer, revival, spiritual warfare, etc. I have chosen, instead, to deal with those in later posts. Here I will deal with the subject more broadly. 1. Holiness by J.C. Ryle. This work is a well known classic that has helped many. I learned of it reading Helen Roseveare's book on the same subject. In the introduction she spoke of the tremendous impact of a particular book on a number of the missionaries years earlier. The impact was such that it she could describe it as revival. That book was Ryle's Holiness. It is a book that every Christian should read. 2. Discussions, vol. 1 by Robert L. Dabney. This book deals with a number of subjects and not all on the topic of sanctification. However, there are a number of outstanding articles on a variety of relevant subjects including Christian economy (or our use of material resources), the moral effects of free justification, new birth, the Christian Sabbath, meditation, prayer, and love for enemies. This book has long been one of my favourites. It is a fascinating, edifying read! 3. 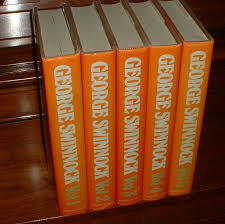 The Christian Man's Calling by George Swinnock (vol, 1, 2 and 3 of his works). Here is a work that is truly comprehensive. He seems to cover everything and in a way that profoundly practical. I found it immensely helpful though it takes some time. For something simpler and shorter consider Scudder. 4. The Christian's Daily Walk by Henry Scudder. 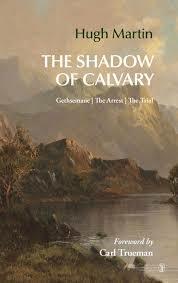 This book was one of John Owen's favourites. That alone speaks volumes (and not just because Owen wrote so many volumes)! It is a very practical treatment of a great subject and one that will leave you at once impressed with the gravity of your calling and then trembling as you consider what it means to be a Christian. There are few books like this anymore. Few men think this way anymore. If you are not in earnest about holiness don't even think about reading this book. It isn't for the faint of heart! But if you are serious about this all important pursuit than you can't do much better than this: buy and read and pray over The Christian's Daily Walk. 5. The Works of John Owen, vol. 6. There are a few works in this one volume, but all of them are of great value. Here you will find the classic, Of the Mortification of Sin in Believers and the old favourite (of men like John Newton and many others), The Nature and Power of Indwelling Sin; as well as the profoundly encouraging exposition of Psalm 130. All of them are valuable and the effort it will take to read them. 6. 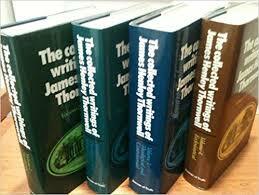 The Collected Writings of James Henley Thornwell, vol. 2. If you can get a copy you will have found a true gem. Here Thornwell deals with such themes as missions, ethics, sincerity, vows, faithfulness, and consistency in a manner that is truly unusual. He writes as others preach. Indeed some of these articles are sermons. But all of them breathe with the author's passion for holiness and love for Christ. I found them deeply challenging and enriching. I am amazed that I did not discover them earlier. They are sadly overlooked and therefore underrated by the Church today. Join us for worship Sundays at 10:00am and 3:00pm. "... the gospel I desire to preach, is, will you have a Christ to work faith, repentance, love, and all good in you, and to stand between you and the sword of divine wrath? Here there is no room for you to object, that you are not qualified, because you are such an hardened unhumbled, blind, and stupid wretch: for the question is not, will you remove these evils, and then come to Christ? but, will you have a Christ to remove them for you?